• There are only 3 ‘rules’ for everyone at Treecreepers: Look after your-self, Look after each other and Look after the environment. • The accompanying teachers, helpers and assistants are expected to support, encourage and become involved with the children on their learning journeys. • Sessions will be held in all weather conditions (except extremely high winds) so teachers, helpers and assistants will need to be dressed well. • Communication is essential! We will let you know all relevant information about activities, safety and other matters when it is needed. Please let US know if you have any concerns, queries, observations and feedback etc. • You are a role model and children WILL copy you in every aspect of their learning. Please bear in mind those small eyes and ears that are following you! • All Treecreepers staff love cake!! Treecreepers understands that it is sometimes difficult to not step in and stop children getting covered in mud, dragging sticks and jumping in puddles when these things would sometimes be discouraged. These are essential elements of their connection with the natural world and vital in increasing body-awareness, motor skills, self-confidence and self-esteem. Unless you believe a child to be in danger please remain calm about mucky faces and encourage them in their explorative journeys…..it’s only dirt! Sessions may involve the children climbing, running, shouting, testing physical and emotional boundaries and becoming muddy and dirty (and sometimes wet). Do not be alarmed by this! This is all part of Treecreepers’ hands-on learning process. Remember clothes and children are 100% washable. If you do notice anyone is cold, hungry or thirsty please act quickly to either assist them or let us know. 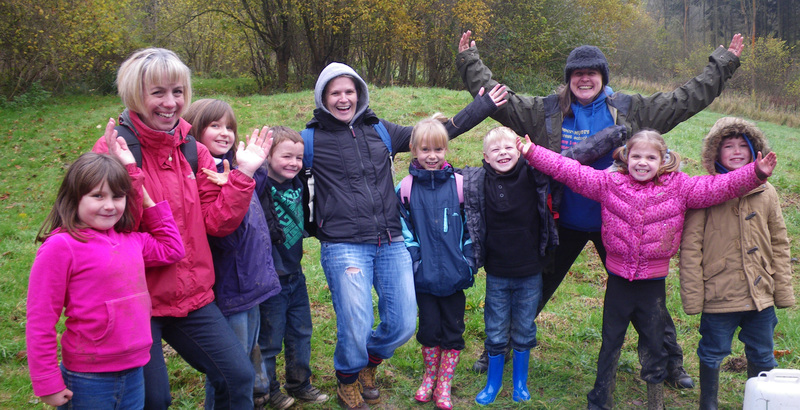 At first it’s normal for some children to feel a bit frightened or overwhelmed in the woods. They may look to you for reassurance. Some other children will explode and want to run and shout and feel. If you can, run with them, laugh with them, be in the moment with them. When they get comfortable the children will start to interact fully with the woods. Some will love the textures of mud and water and trees. Others will hold back watching, worried about getting dirty or germs. Encourage both! Remember even if you feel squeamish it’s important not to show it too much… Getting a child to help you pick up a spider because you are worried is great but screaming and running away not so! Let us know if anything really worries you and we can help. The children you work with have lots to teach you in the woods – you just need to know where to look. One of your essential roles at Forest School is just to observe these familiar children in a new setting for them. How are they different, how are they the same? They will look to you for their cues –for reassurance, praise and boundaries. It is very useful to us if you can feedback on the children’s experiences. You know how the children usually act much better than we do! If you are unsure at any point, ask us, we probably didn’t explain things perfectly and if you don’t understand it’s likely the children don’t either. « What is the leader’s role?